Usain Bolt is the fastest man in the world. He made the competition look silly during the 100-meter finals in Beijing and cruised so easily to victory that he was celebrating before the race was even over. Wondering how sick the speedy Jamaican's time could have been had he given it 100 percent throughout the entire race? Norwegian physicists have got you covered, “We estimate that he could have finished the race in a time between 9.55 and 9.61." 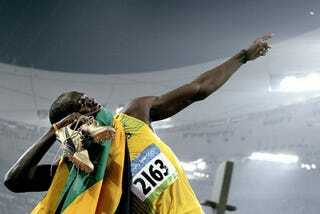 That's fast, maybe a little too fast says Olympic legend Carl Lewis who recently implied that Bolt may be on the juice. According to the Associated Press, Bolt's ridiculous performance could have been even faster. Bolt won the final at the Olympics last month in 9.69 seconds, shaving 0.03 seconds off the record he set in May. Eriksen, a physicist at the Institute of Theoretical Astrophysics at the University of Oslo, said he got the idea to examine how fast Bolt could have gone after hearing his coach say that Bolt could have run 9.52 seconds. While Bolt definitely could have gone harder, he may not have wanted to just yet due to financial incentives often associated with breaking world records. Something he should be able to do in the future. But Carl Lewis, speaking in an upcoming issue of Sports Illustrated, thinks something is fishy with Bolt's radical improvement. "But to run 10.03 seconds one year and 9.69 the next, if you don't question that in a sport with the reputation it has right now, you're a fool. Period."